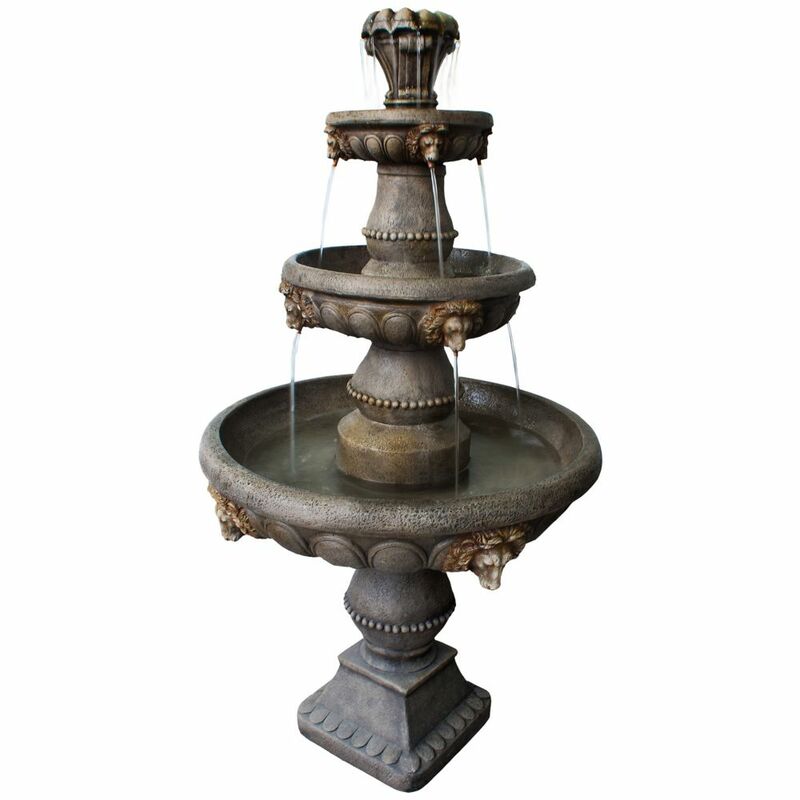 This classic tiered fountain features a warm finish and soothing spills. A great conversation piece in any setting. Includes energy efficient pump with 15 foot cord. Royal Lion Fountain This classic tiered fountain features a warm finish and soothing spills. A great conversation piece in any setting. Includes energy efficient pump with 15 foot cord. Royal Lion Fountain is rated 3.0 out of 5 by 4. Rated 1 out of 5 by sailor from Nice but short lived Pump failed this year ( one month into the unit's third season). I replaced pump but while reassembling the fountain the locking ring moulded to the bottom of the first tier that attaches that tier to the base fractured and broke off in several pieces. Not great performance. Note....fountain was always stored indoors in the off season. Rated 1 out of 5 by Bill from Very poor quality Cannot believe the poor quality of this fountain. First of all, had to have the second tier replaced because the ring area split, the replacement is also not very well made at the ring spot of the tier. Secondly, the fountain is very out of whack. Measured with a digital level, 1st section is 0 degrees. 2nd is 12 degrees. 3rd is 34 degrees. top is 78 degrees because the top of the "flower" is very crooked. Rated 5 out of 5 by Valley Girl from Beautiful Fountain! We bought this fountain as a replacement for one that was very similar. This one seems better made and heavier. I think the company has improved on a previously made fountain. I am sure we will enjoy this one for a good many years the same as the first one we bought from Home Depot. Rated 5 out of 5 by GWW1 from Wonderful Centrepiece for our Garden I bought this 1 month ago ,sight unseen, relying on the specs.on the web. It is the first fountain I have owned and I am glad to own it. It came in a large box that barely fit in my Mazda 5. It assembles quite easily, but make sure it is level, before filling with water,otherwise you will need to drain it and re-level it as water will spill out over one side or the other. Our garden area is Aprox.20' X 20' and it is large enough to be a prominent Centrepiece. It has an antiqued marble look and is decorated with antiqued Lions heads in antique gold hue on the 3 "bowls" of the fountain. The lions heads act as fonts on two of the bowls with water flowing out of their mouths. The flowing water sound is very pleasant loud enough to fill our garden and drown out the background noise from our inner city location. Note that the water will foam in the bowls at first, but as you keep adding water to top up the fountain, the foam will decrease and eventually stop forming. I have been considering buying this for the last two years, but the first review here which shows that that fountain is not even makes me nervous . Could you look at the photo and then comment on it please? Thanks for your great question. It's unfortunate that the other reviewer did not contact us directly for assistance regarding the assembly. First and foremost, these items are handcrafted by talented artisans and while there can be minor variations from one piece to the next, each and every fountain is assembled, checked and tested prior to packaging. Furthermore, many of the parts can assemble in 1 of 2 possible orientations; it is possible that the alignment of the item could be impacted if our assembly orientation recommendations are not followed. During the testing and packaging stages, assembly guide markings are installed on the pieces to guide for proper and level assembly. As always though, our customer support team is ready to assist should you have any questions or concerns. Hi , when will this item be available and can you deliver to home address pls ? This item is available in-store only. You can check availability for pickup at a store near you online at www.homedepot.ca or you can call a store and have them check store of store SKU # 1000720680. Unfortunately, this item is not available for home delivery at this time.